Welcome, Mama – it’s Reading & Writing Wednesday! Today’s agenda: a fun phonics game. 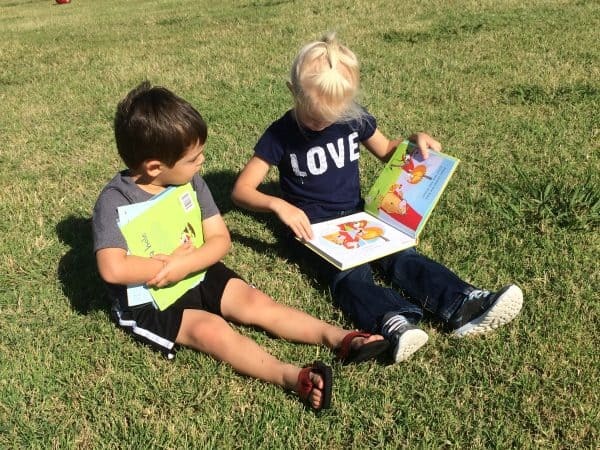 Want to raise a successful speed reader and a stellar speller? The key to mastering both reading and spelling is phonemic awareness, which is a fancy way of saying “recognizing sounds and their corresponding letters.” Remember “How now brown cow?” Brown cow now with this phonics game! At Kandy Apple Mama, we are completely dedicated to raising smarter, kinder, more successful children. Tall order, am I right? But we’re absolutely up for the job and you can be too! 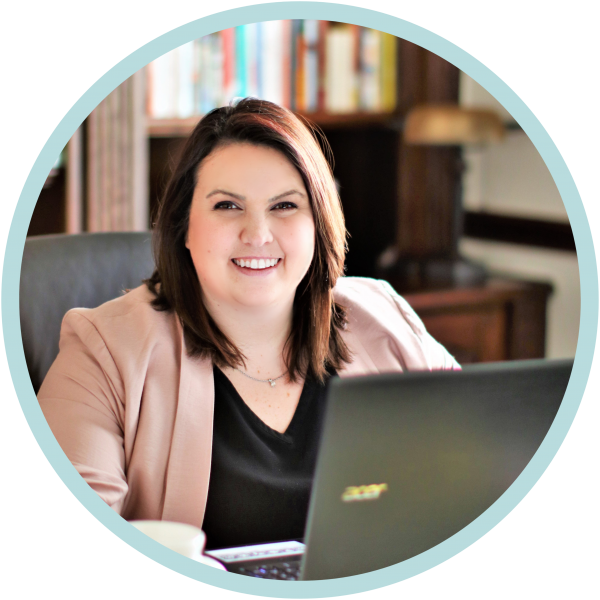 Our first steps to help our children embrace education is detailed in our Beyond the Classroom initiative. Learning isn’t just for school; the world is our oyster and opportunities to learn are everywhere! We take everyday objects like beach balls, cups, and plastic Easter eggs (see below!) and turn them into fun learning opportunities! 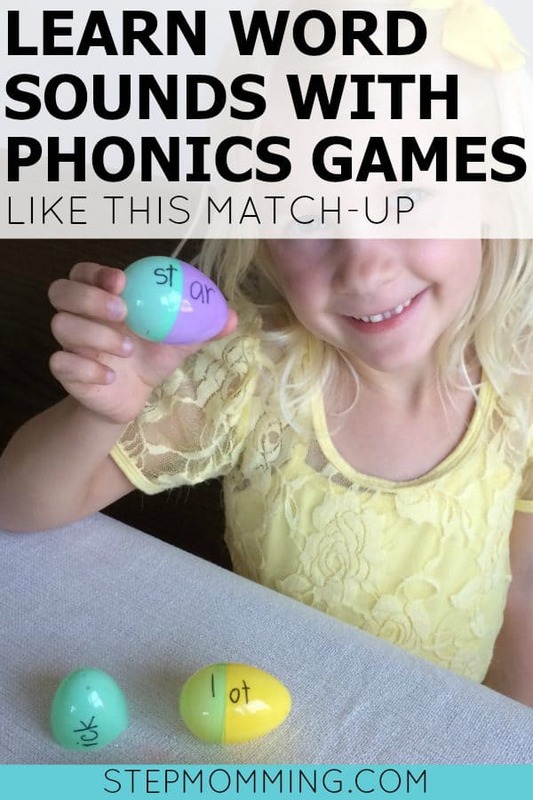 So grab those leftover Easter eggs and a permanent marker to get started on this amazingly fun phonics game! The most difficult part about this game is the prep work, and it really isn’t that hard. 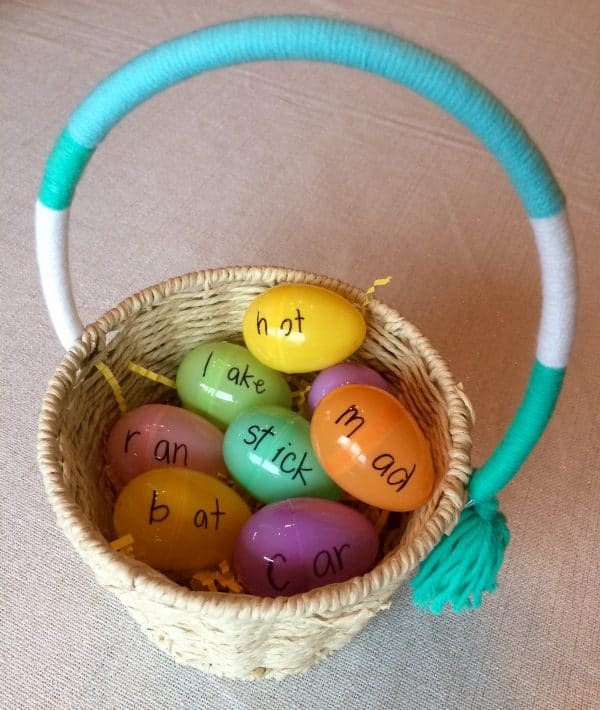 You’ll want to prep at least half a dozen eggs with simple sight words (e.g., car, bat, hot) that have interchangeable halves. The H from Hot and the C from Car can both combine with the second half of Bat to make new words (hat and cat). These kinds of mixtures are exactly what you need for this game! Break the eggs in half and challenge your child to create new words from the egg halves. 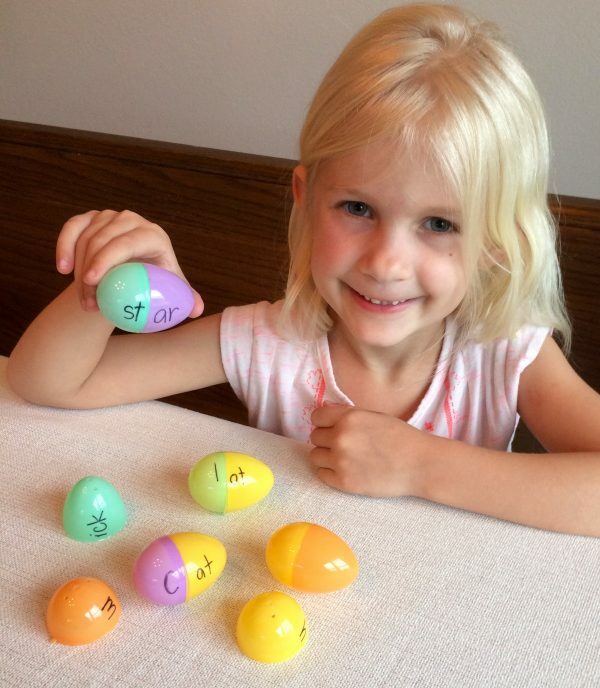 Using phonics and vocabulary knowledge, she will make eggs whole again and create familiar words. In the photo below, K used CAR and STICK to create the word STAR. She also used the word BAT with CAR to create the word CAT. LAKE and HOT became LOT. There’s no real end goal in this game that your child “wins,” so it could last as long as you want. You could do it for 5 minutes or an hour! As long as your child is still pushing herself to really understand phonics and to create new words, there’s no reason to quit the game. In fact, about an hour after K and I played this game the first time, I found her back in her room playing with the eggs again. She said she loved making new words so much she didn’t want to stop playing! If you want to make it more competitive to give your child a little added motivation, get a friend or sibling to join in. Make twice as many eggs, and divvy them up between all the players. See how many words each participant can make in 5 minutes. Be sure to keep track and tally up each successful word. The one with the most words wins! To continue the phonics lessons long beyond the egg game, I highly recommend the Phonics Readers series from Usborne. Both K (7) and her cousin (3) love these books! They’re funny, colorful, and really help to develop phonemic awareness. A few of our favorites are included in the Cow Takes a Bow and Other Tales compilation, which K is reading to her cousin above. It contains several stories with different phonetic emphases. These make great bedtime stories or just awesome playground companions! 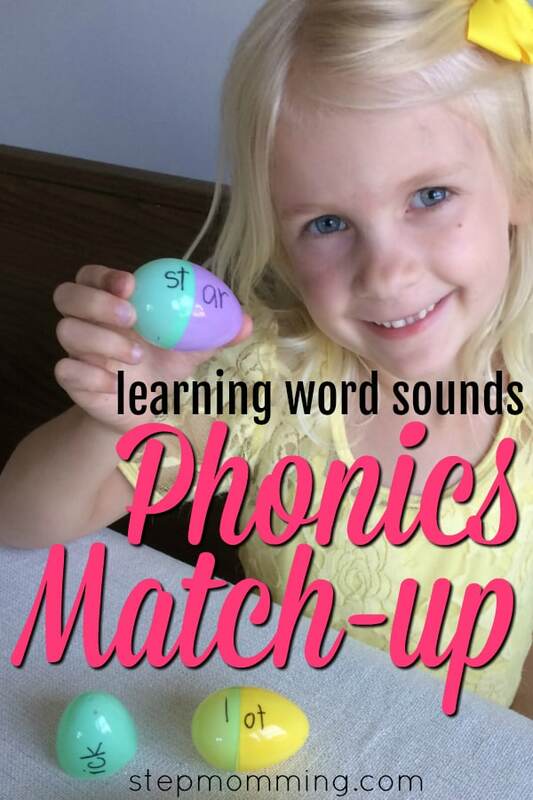 Beyond the plastic egg word matching and reading targeted books, what are your favorite ways to teach your kiddos phonics? Leave a comment below – I love hearing from you!